This entry was posted on January 27, 2013 by Luke Chilson. You’ve got a 3D Printer, or you’re looking to buy a 3D Printer and each one seems to indicate it prints in either ABS, PLA, or both. So you find yourself wanting to know, what is the difference between ABS and PLA. There are many materials that are being explored for 3D Printing, however you will find that the two dominant plastics are ABS and PLA. Both ABS and PLA are known as thermoplastics; that is they become soft and moldable when heated and return to a solid when cooled. This process can be repeated again and again. Their ability to melt and be processed again is what has made them so prevalent in society and is why most of the plastics you interact with on a daily basis are thermoplastics. Now while there are many thermoplastics, very few of them are currently used for 3D Printing. For a material to prove viable for 3D Printing, it has to pass three different tests; initial extrusion into Plastic Filament, second extrusion and trace-binding during the 3D Printing process, then finally end use application. To pass all three tests, a material’s properties must lend desirably to first, it’s formation into the raw 3D Printer feedstock called Plastic Filament; second, process well during 3D Printing giving visually pleasing and physically accurate parts; and lastly, it’s properties should match the intended application, whether that be strength, durability, gloss, you name it. Often, a material will pass one test so superbly, that it becomes worth the extra effort to battle with it during its other stages. Polycarbonate, a lesser known printing material is this way. For some applications, it’s strength and temperature resistance makes it worth the battle to print accurate and fully fused parts. The first test, that of production from base plastic resin into top-notch Plastic Filament such as what we carry is a strict and carefully monitored process. It is a battle of wits and engineering that takes the plastic from a pile of pellets to a uniformly dense, bubble free, consistently sized, round rod. Here there is little difference between ABS and PLA; most thermoplastics can pass this test, it is mainly just a question of the time and costs required to do so while still producing Plastic Filament that runs smoothly and consistently during the next stage, 3D Printing. Here is where the two plastics divide and will help to explain why different groups prefer one over the other. Both ABS and PLA do best if, before use or when stored long term, they are sealed off from the atmosphere to prevent the absorption of moisture from the air. This does not mean your plastic will be ruined by a week of sitting on a bench in the shop, but long term exposure to a humid environment can have detrimental effects, both to the printing process and to the quality of finished parts. ABS – Moisture laden ABS will tend to bubble and spurt from the tip of the nozzle when printing; reducing the visual quality of the part, part accuracy, strength and introducing the risk of a stripping or clogging in the nozzle. ABS can be easily dried using a source of hot (preferably dry) air such as a food dehydrator. PLA – PLA responds somewhat differently to moisture, in addition to bubbles or spurting at the nozzle, you may see discoloration and a reduction in 3D printed part properties as PLA can react with water at high temperatures and undergo de-polymerization. While PLA can also be dried using something as simple as a food dehydrator, it is important to note that this can alter the crystallinity ratio in the PLA and will possibly lead to changes in extrusion temperature and other extrusion characteristics. For many 3D Printers, this need not be of much concern. ABS – While printing ABS, there is often a notable smell of hot plastic. While some complain of the smell, there are many who either do not notice it or do not find it to be particularly unbearable. Ensuring proper ventilation in small rooms, that the ABS used is pure and free of contaminants and heated to the proper temperature in a reliable extruder can go a long way in reducing the smell. PLA – PLA on the other hand, being derived from sugar gives off a smell similar to a semi-sweet cooking oil. While it certainly won’t bring back fond memories of home-cooked meals, it is considered by many an improvement over hot plastic. Both ABS and PLA are capable of creating dimensionally accurate parts. However, there are a few points worthy of mention regarding the two in this regard. ABS – For most, the single greatest hurdle for accurate parts in ABS will be a curling upwards of the surface in direct contact with the 3D Printer’s print bed. A combination of heating the print surface and ensuring it is smooth, flat and clean goes a long way in eliminating this issue. Additionally, some find various solutions can be useful when applied beforehand to the print surface. For example, a mixture of ABS/Acetone, or a shot of hairspray. For fine features on parts involving sharp corners, such as gears, there will often be a slight rounding of the corner. A fan to provide a small amount of active cooling around the nozzle can improve corners but one does also run the risk of introducing too much cooling and reducing adhesion between layers, eventually leading to cracks in the finished part. PLA – Compared to ABS, PLA demonstrates much less part warping. For this reason it is possible to successfully print without a heated bed and use more commonly available “Blue” painters tape as a print surface. Ironically, totally removing the heated bed can still allow the plastic to curl up slightly on large parts, though not always. PLA undergoes more of a phase-change when heated and becomes much more liquid. If actively cooled, much sharper details can be seen on printed corners without the risk of cracking or warp. The increased flow can also lead to stronger binding between layers, improving the strength of the printed part. In addition to a part being accurately made, it must also perform in its intended purpose. ABS – ABS as a polymer can take many forms and can be engineered to have many properties. In general, it is a strong plastic with mild flexibility (compared to PLA). Natural ABS before colorants have been added is a soft milky biege. The flexibility of ABS makes creating interlocking pieces or pin connected pieces easier to work with. It is easily sanded and machined. Notably, ABS is soluble in Acetone allowing one to weld parts together with a drop or two, or smooth and create high gloss by brushing or dipping full pieces in Acetone. It’s strength, flexibility, machinability, and higher temperature resistance make it often a preferred plastic by engineers and those with mechanical uses in mind. PLA – Created from processing any number of plant products including corn, potatoes or sugar-beets, PLA is considered a more ‘earth friendly’ plastic compared to petroleum based ABS. Used primarily in food packaging and containers, PLA can be composted at comercial compost facilities. It won’t bio-degrade in your backyard or home compost pile however. It is natural transparent and can be colored to various degrees of translucency and opacity. Also strong, and more rigid than ABS, it is occasionally more difficult to work with in complicated interlocking assemblies and pin-joints. Printed objects will generally have a glossier look and feel than ABS. With a little more work, PLA can also be sanded and machined. The lower melting temperature of PLA makes it unsuitable for many applications as even parts spending the day in a hot car can droop and deform. Simplifying the myriad factors that influence the use of one material over the other, broad strokes draw this comparison. ABS – It’s strength, flexibility, machinability, and higher temperature resistance make it often a preferred plastic for engineers, and professional applications. The hot plastic smell deter some as does the plastics petroleum based origin. The additional requirement of a heated print bed means there are some printers simply incapable of printing ABS with any reliability. PLA – The wide range of available colors and translucencies and glossy feel often attract those who print for display or small household uses. Many appreciate the plant based origins and prefer the semi-sweet smell over ABS. When properly cooled, PLA seems to have higher maximum printing speeds, lower layer heights, and sharper printed corners. Combining this with low warping on parts make it a popular plastic for home printers, hobbyists, and schools. Additive manufacturing or 3D printing is a process of making a three-dimensional solid object of virtually any shape from a digital model. 3D printing is achieved using an additive process, where successive layers of material are laid down in different shapes. 3D printing is also considered distinct from traditional machining techniques, which mostly rely on the removal of material by methods such as cutting or drilling (subtractive processes). A materials printer usually performs 3D printing processes using digital technology. The first working 3D printer was created in 1984 by Chuck Hull of 3D Systems Corp. Since the start of the 21st century there has been a large growth in the sales of these machines, and their price has dropped substantially. According to Wohlers Associates, a consultancy, the market for 3D printers and services was worth $2.2 billion worldwide in 2012, up 29% from 2011. The 3D printing technology is used for both prototyping and distributed manufacturing with applications in architecture, construction (AEC),industrial design, automotive, aerospace, military, engineering, civil engineering, dental and medical industries, biotech (human tissue replacement), fashion, footwear, jewelry, eyewear, education, geographic information systems, food, and many other fields. It has been speculated that 3D printing may become a mass market item because open source 3D printing can easily offset their capital costs by enabling consumers to avoid costs associated with purchasing common household objects. Although scientists and technicians have long been fascinated with the idea of replicating technology, it was not until the 1980s that the concept of 3D printing really began to be taken seriously.. The man most often credited with inventing the language of ‘modern’ 3D printer is Charles W. Hull, who first patented the term ‘stereolithography’ (defined as “system for generating three-dimensional objects by creating a cross-sectional pattern of the object to be formed”) in 1984. The term additive manufacturing refers to technologies that create objects through a sequential layering process. Objects that are manufactured additively can be used anywhere throughout the product life cycle, from pre-production (i.e. rapid prototyping) to full-scale production (i.e. rapid manufacturing), in addition to tooling applications and post-production customization. In manufacturing, and machining in particular, subtractive methods are typically coined as traditional methods. The very term subtractive manufacturing is a retronym developed in recent years to distinguish it from newer additive manufacturing techniques. Although fabrication has included methods that are essentially “additive” for centuries (such as joining plates, sheets, forgings, and rolled work via riveting, screwing, forge welding, or newer kinds of welding), it did not include the information technology component of model-based definition. Machining (generating exact shapes with high precision) has typically been subtractive, from filing and turning to milling and grinding. A standard data interface between CAD software and the machines is the STL file format. An STL file approximates the shape of a part or assembly using triangular facets. Smaller facets produce a higher quality surface. PLY is a scanner generated input file format, and VRML(or WRL) files are often used as input for 3D printing technologies that are able to print in full color. To perform a print, the machine reads the design from an .stl file and lays down successive layers of liquid, powder, paper or sheet material to build the model from a series of cross sections. These layers, which correspond to the virtual cross sections from the CAD model, are joined or automatically fused to create the final shape. The primary advantage of this technique is its ability to create almost any shape or geometric feature. Printer resolution describes layer thickness and X-Y resolution in dpi (dots per inch), or micrometers. Typical layer thickness is around 100 micrometers (µm), although some machines such as the Objet Connex series and 3D Systems’ ProJet series can print layers as thin as 16 µm. X-Y resolution is comparable to that of laser printers. The particles (3D dots) are around 50 to 100 µm in diameter. Construction of a model with contemporary methods can take anywhere from several hours to several days, depending on the method used and the size and complexity of the model. Additive systems can typically reduce this time to a few hours, although it varies widely depending on the type of machine used and the size and number of models being produced simultaneously. Traditional techniques like injection molding can be less expensive for manufacturing polymer products in high quantities, but additive manufacturing can be faster, more flexible and less expensive when producing relatively small quantities of parts. 3D printers give designers and concept development teams the ability to produce parts and concept models using a desktop size printer. Though the printer-produced resolution is sufficient for many applications, printing a slightly oversized version of the desired object in standard resolution, and then removing material with a higher-resolution subtractive process can achieve greater precision. Some additive manufacturing techniques are capable of using multiple materials in the course of constructing parts. Some are able to print in multiple colors and color combinations simultaneously. Some also utilize supports when building. Supports are removable or dissolvable upon completion of the print, and are used to support overhanging features during construction. The Audi RSQ was made with rapid prototyping industrial KUKA robots. Several different 3D printing processes have been invented since the late 1970s. The printers were originally large, expensive, and highly limited in what they could produce. A number of additive processes are now available. They differ in the way layers are deposited to create parts and in the materials that can be used. Some methods melt or soften material to produce the layers, e.g. selective laser melting (SLM) or direct metal laser sintering(DMLS), selective laser sintering (SLS), fused deposition modeling (FDM), while others cure liquid materials using different sophisticated technologies, e.g. stereolithography (SLA). With laminated object manufacturing (LOM), thin layers are cut to shape and joined together (e.g. paper, polymer, metal). Each method has its own advantages and drawbacks, and some companies consequently offer a choice between powder and polymer for the material from which the object is built. Some companies use standard, off-the-shelf business paper as the build material to produce a durable prototype. The main considerations in choosing a machine are generally speed, cost of the 3D printer, cost of the printed prototype, and cost and choice of materials and color capabilities. Printers that work directly with metals are expensive. In some cases, however, less expensive printers can be used to make a mould, which is then used to make metal parts. Fused deposition modeling: 1 – nozzle ejecting molten plastic, 2 – deposited material (modeled part), 3 – controlled movable table. Fused deposition modeling (FDM) was developed by S. Scott Crump in the late 1980s and was commercialized in 1990 by Stratasys.With the expiration of patent on this technology there is now a large open-source development community this type of 3D printer (e.g.RepRaps) and many commercial and DIY variants, which have dropped the cost by two orders of magnitude. Fused deposition modeling uses a plastic filament or metal wire that is wound on a coil and unreeled to supply material to an extrusionnozzle, which turns the flow on and off. The nozzle heats to melt the material and can be moved in both horizontal and vertical directions by a numerically controlled mechanism that is directly controlled by a computer-aided manufacturing (CAM) software package. The model or part is produced by extruding small beads of thermoplastic material to form layers as the material hardens immediately after extrusion from the nozzle. Stepper motors or servo motors are typically employed to move the extrusion head. Various polymers are used, including acrylonitrile butadiene styrene (ABS), polycarbonate (PC), polylactic acid (PLA), high density polyethylene (HDPE), PC/ABS, and polyphenylsulfone (PPSU). In general the polymer is in the form of a filament, fabricated from virgin resins. Multiple projects in the open-source community exist that are aimed at processing post-consumer plastic waste into filament. These involve machines to shred and extrude the plastic material into filament. FDM has some restrictions on the shapes that may be fabricated. For example, FDM usually cannot produce stalactite-like structures, since they would be unsupported during the build. These have to be avoided or a thin support may be designed into the structure which can be broken away during finishing processes. The CandyFab granular printing system uses heated air and granulated sugar to produce food-grade art objects. Another 3D printing approach is the selective fusing of materials in a granular bed. The technique fuses parts of the layer, and then moves the working area downwards, adding another layer of granules and repeating the process until the piece has built up. This process uses the unfused media to support overhangs and thin walls in the part being produced, which reduces the need for temporary auxiliary supports for the piece. A laser is typically used to sinter the media into a solid. Examples include selective laser sintering (SLS), with both metals and polymers (e.g. PA, PA-GF, Rigid GF, PEEK, PS, Alumide, Carbonmide, elastomers), and direct metal laser sintering (DMLS). Selective Laser Sintering (SLS) was developed and patented by Dr. Carl Deckard and Dr. Joseph Beaman at the University of Texas at Austin in the mid-1980s, under sponsorship of DARPA. A similar process was patented without being commercialized by R. F. Housholder in 1979. Selective Laser Melting (SLM) does not use sintering for the fusion of powder granules but will completely melt the powder using a high-energy laser to create fully dense materials in a layerwise method with similar mechanical properties to conventional manufactured metals. Electron beam melting (EBM) is a similar type of additive manufacturing technology for metal parts (e.g. titanium alloys). EBM manufactures parts by melting metal powder layer by layer with an electron beam in a high vacuum. Unlike metal sintering techniques that operate below melting point, EBM parts are fully dense, void-free, and very strong. Another method consists of an inkjet 3D printing system. The printer creates the model one layer at a time by spreading a layer of powder (plaster, or resins) and printing a binder in the cross-section of the part using an inkjet-like process. This is repeated until every layer has been printed. This technology allows the printing of full color prototypes, overhangs, and elastomer parts. The strength of bonded powder prints can be enhanced with wax or thermoset polymer impregnation. In some printers, paper can be used as the build material, resulting in a lower cost to print. During the 1990s some companies marketed printers that cut cross sections out of special adhesive coated paper using a carbon dioxide laser, and then laminated them together. In 2005, Mcor Technologies Ltd developed a different process using ordinary sheets of office paper, a Tungsten carbide blade to cut the shape, and selective deposition of adhesive and pressure to bond the prototype. There are also a number of companies selling printers that print laminated objects using thin plastic and metal sheets. Stereolithography was patented in 1987 by Chuck Hull. Photopolymerization is primarily used in stereolithography (SLA) to produce a solid part from a liquid.This process dramatically redefined previous efforts, from the Photosculpture method of François Willème (1830-1905) in 1860 through the photopolymer process of Mitsubishi`s Matsubara in 1974. In digital light processing (DLP), a vat of liquid polymer is exposed to light from a DLP projector under safelight conditions. The exposed liquid polymer hardens. The build plate then moves down in small increments and the liquid polymer is again exposed to light. The process repeats until the model has been built. The liquid polymer is then drained from the vat, leaving the solid model. The EnvisionTec Ultra is an example of a DLP rapid prototyping system. Inkjet printer systems like the Objet PolyJet system spray photopolymer materials onto a build tray in ultra-thin layers (between 16 and 30 µm) until the part is completed. Each photopolymer layer is cured with UV light after it is jetted, producing fully cured models that can be handled and used immediately, without post-curing. The gel-like support material, which is designed to support complicated geometries, is removed by hand and water jetting. It is also suitable for elastomers. Ultra-small features can be made with the 3D microfabrication technique used in multiphoton photopolymerization. This approach traces the desired 3D object in a block of gel using a focused laser. Due to the nonlinear nature of photoexcitation, the gel is cured to a solid only in the places where the laser was focused and the remaining gel is then washed away. Feature sizes of under 100 nm are easily produced, as well as complex structures with moving and interlocked parts. Yet another approach uses a synthetic resin that is solidified using LEDs. Several projects and companies are making efforts to develop affordable 3D printers for home desktop use. Much of this work has been driven by and targeted at DIY/enthusiast/early adopter communities, with additional ties to the academic and hacker communities. 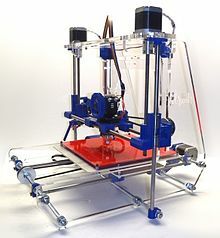 RepRap is one of the longest running projects in the desktop category. The RepRap project aims to produce a free and open source software (FOSS) 3D printer, whose full specifications are released under the GNU General Public License, and which is capable of replicating itself by printing many of its own (plastic) parts to create more machines. Research is under way to enable the device to printcircuit boards and metal parts. Because of the FOSS aims of RepRap, many related projects have used their design for inspiration, creating an ecosystem of related or derivative 3D printers, most of which are also open source designs. The availability of these open source designs means that variants of 3D printers are easy to invent. The quality and complexity of printer designs, however, as well as the quality of kit or finished products, varies greatly from project to project. This rapid development of open source 3D printers is gaining interest in many spheres as it enables hyper-customization and the use of public domain designs to fabricate open source appropriate technology through conduits such as Thingiverse and Cubify. This technology can also assist initiatives in sustainable development since technologies are easily and economically made from resources available to local communities. The cost of 3D printers has decreased dramatically since about 2010, with machines that used to cost $20,000 costing less than $1,000. For instance, as of 2013, several companies and individuals are selling parts to build various RepRap designs, with prices starting at about €400 /US$500. The price of printer kits vary from US$400 for the Printrbot Jr. (derived from the previous RepRap models), to US$599 for the RoBo 3D Printer to over US$2000 for the Fab@Home 2.0 two-syringe system. The Shark 3D printer comes fully assembled for less than US$2000. The open source Fab@Home project has developed printers for general use with anything that can be squirted through a nozzle, from chocolate to silicone sealant and chemical reactants. Printers following the project’s designs have been available from suppliers in kits or in pre-assembled form since 2012 at prices in the US$2000 range. The development and hyper-customization of the RepRap-based 3D printers has produced a new category of printers suitable for both domestic and commercial use. 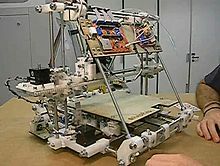 The least expensive assembled machine available is the Solidoodle 2, while the RepRapPro’s Huxley DIY kit is reputedly[weasel words] one of the more reliable of the lower-priced machines, at around US$680. There are other RepRap-based high-end kits and fully assembled machines that have been enhanced to print at high speed and high definition. Depending on the application, the print resolution and speed of manufacturing lies somewhere between a personal printer and an industrial printer. A list of printers with pricing and other information is maintained. Most recently delta robots have been utilized for 3D printing to increase fabrication speed further. Three-dimensional printing makes it as cheap to create single items as it is to produce thousands and thus undermines economies of scale. It may have as profound an impact on the world as the coming of the factory did….Just as nobody could have predicted the impact of the steam engine in 1750—or the printing press in 1450, or the transistor in 1950—it is impossible to foresee the long-term impact of 3D printing. But the technology is coming, and it is likely to disrupt every field it touches. An example of 3D printed limited editionjewellery. This necklace is made of glassfiber-filled dyed nylon. It has rotating linkages that were produced in the same manufacturing step as the other parts. Additive manufacturing’s earliest applications have been on the toolroom end of the manufacturing spectrum. For example, rapid prototyping was one of the earliest additive variants, and its mission was to reduce the lead time and cost of developing prototypes of new parts and devices, which was earlier only done with subtractive toolroom methods (typically slowly and expensively). With technological advances in additive manufacturing, however, and the dissemination of those advances into the business world, additive methods are moving ever further into the production end of manufacturing in creative and sometimes unexpected ways. Parts that were formerly the sole province of subtractive methods can now in some cases be made more profitably via additive ones. Standard applications include design visualization, prototyping/CAD, metal casting, architecture, education, geospatial, healthcare, and entertainment/retail. Full color miniature face models produced on a 3D Printer. Industrial 3D printers have existed since the early 1980s and have been used extensively for rapid prototyping and research purposes. These are generally larger machines that use proprietary powdered metals, casting media (e.g. sand), plastics, paper or cartridges, and are used for rapid prototyping by universities and commercial companies. Advances in RP technology have introduced materials that are appropriate for final manufacture, which has in turn introduced the possibility of directly manufacturing finished components. One advantage of 3D printing for rapid manufacturing lies in the relatively inexpensive production of small numbers of parts. Rapid manufacturing is a new method of manufacturing and many of its processes remain unproven. 3D printing is now entering the field of rapid manufacturing and was identified as a “next level” technology by many experts in a 2009 report. One of the most promising processes looks to be the adaptation of laser sintering (LS), one of the better-established rapid prototyping methods. As of 2006, however, these techniques were still very much in their infancy, with many obstacles to be overcome before RM could be considered a realistic manufacturing method. Companies have created services where consumers can customize objects using simplified web based customization software, and order the resulting items as 3D printed unique objects. This now allows consumers to create custom cases for their mobile phones.Nokia has released the 3D designs for its case so that owners can customize their own case and have it 3D printed. The current slow print speed of 3D printers limits their use for mass production. To reduce this overhead, several fused filament machines now offer multiple extruder heads. These can be used to print in multiple colors, with different polymers, or to make multiple prints simultaneously. This increases their overall print speed during multiple instance production, while requiring less capital cost than duplicate machines since they can share a single controller. Distinct from the use of multiple machines, multi-material machines are restricted to making identical copies of the same part, but can offer multi-color and multi-material features when needed. The print speed increases proportionately to the number of heads. Furthermore, the energy cost is reduced due to the fact that they share the same heated print volume. Together, these two features reduce overhead costs. Many printers now offer twin print heads. However, these are used to manufacture single (sets of) parts in multiple colors/materials. Few studies have yet been done in this field to see if conventional subtractive methods are comparable to additive methods. As of 2012, domestic 3D printing has mainly captivated hobbyists and enthusiasts and has not quite gained recognition for practical household applications. A working clock has been made and gears have been printed for home woodworking machines among other purposes. 3D printing is also used for ornamental objects. Web sites associated with home 3D printing tend to include backscratchers, coathooks, etc. among their offered prints. The open source Fab@Home project has developed printers for general use. They have been used in research environments to produce chemical compounds with 3D printing technology, including new ones, initially without immediate application as proof of principle. The printer can print with anything that can be dispensed from a syringe as liquid or paste. The developers of the chemical application envisage that this technology could be used for both industrial and domestic use. Including, for example, enabling users in remote locations to be able to produce their own medicine or household chemicals. 3D printing has spread into the world of clothing with fashion designers experimenting with 3D-printed bikinis, shoes, and dresses. In commercial production Nike is using 3D printing to prototype and manufacture the 2012 Vapor Laser Talon football shoe for players of American football, and New Balance is 3D manufacturing custom-fit shoes for athletes. Some companies offer on-line 3D printing services open to both consumers and industries. Such services require people to upload their 3D designs to the company website. Designs are then 3D printed using industrial 3D printers and either shipped to the customer or in some cases, the consumer can pick the object up at the store. Future applications for 3D printing might include creating open-source scientific equipment or other science-based applications like reconstructing fossils in paleontology, replicating ancient and priceless artifacts in archaeology, reconstructing bones and body parts in forensic pathology, and reconstructing heavily damaged evidence acquired from crime scene investigations. The technology is even being explored for building construction. In 2005, academic journals had begun to report on the possible artistic applications of 3D printing technology. By 2007 the mass media followed with an article in the Wall Street Journal and Time Magazine, listing a 3D printed design among their 100 most influential designs of the year. During the 2011 London Design Festival, an installation, curated by Murray Moss and focused on 3D Printing, was held in the Victoria and Albert Museum (the V&A). The installation was called Industrial Revolution 2.0: How the Material World will Newly Materialize. As of 2012, 3D printing technology has been studied by biotechnology firms and academia for possible use in tissue engineering applications in which organs and body parts are built using inkjet techniques. In this process, layers of living cells are deposited onto a gel medium or sugar matrix and slowly built up to form three-dimensional structures including vascular systems. Several terms have been used to refer to this field of research: organ printing, bio-printing, body part printing, and computer-aided tissue engineering, among others. A proof-of-principle project at the University of Glasgow, UK, in 2012 showed that it is possible to use 3D printing techniques to create chemical compounds, including new ones. They first printed chemical reaction vessels, then used the printer to squirt reactants into them as “chemical inks” which would then react. They have produced new compounds to verify the validity of the process, but have not pursued anything with a particular application. Cornell Creative Machines Lab has confirmed that it is possible to produce customized food with 3D Hydrocolloid Printing. The use of 3D scanning technologies allows the replication of real objects without the use of moulding techniques that in many cases can be more expensive, more difficult, or too invasive to be performed, particularly for precious or delicate cultural heritage artifacts where direct contact with the molding substances could harm the original object’s surface. An additional use being developed is building printing, or using 3D printing to build buildings. This could allow faster construction for lower costs, and has been investigated for construction of off-Earth habitats. In 2013, Chinese scientists began printing ears, livers and kidneys, with living tissue. Researchers in China have been able to successfully print human organs using specialized 3D bio printers that use living cells instead of plastic. Researchers at Hangzhou Dianzi University actually went as far as inventing their own 3D printer for the complex task, dubbed the “Regenovo” which is a “3D bio printer.” Xu Mingen, Regenovo’s developer, said that it takes the printer under an hour to produce either a mini liver sample or a four to five inch ear cartilage sample. Xu also predicted that fully functional printed organs may be possible within the next ten to twenty years. In the same year, researchers at the University of Hasselt, in Belgium had successfully printed a new jawbone for an 83-year-old Belgian woman. The woman is now able to chew, speak and breathe normally again after a machine printed her a new jawbone. In Bahrain, large-scale 3D printing using a sandstone-like material has been used to create unique coral-shaped structures, which encourage coral polyps to colonize and regenerate damaged reefs. These structures have a much more natural shape than other structures used to create artificial reefs, and have a neutral pH which concrete does not. 3D printing has existed for decades within certain manufacturing industries and many legal regimes, including patents, industrial design rights, copyright, and trademark can apply. However, there is not much jurisprudence to say how these laws will apply if 3D printers become mainstream and individuals and hobbyist communities begin manufacturing items for personal use, for non profit distribution, or for sale. Any of the mentioned legal regimes may prohibit the distribution of the designs used in 3d printing, or the distribution or sale of the printed item. To be allowed to do these things, a person would have to contact the owner and ask for a licence, which may come with conditions and a price. Patents cover an idea, a technique, and generally last 20 years. So if a special type of wheel is patented, then printing and selling such a wheel would be illegal. Two questions which are less clear are whether printing for personal use would be restricted, and whether distributing designs would constitute infringement or a relate offence such as incitement to infringe. Copyright covers an expression and often last for the life of the author plus 70 years thereafter. If someone makes a statue, they may have copyright on the look of that statue, so if someone sees that statue, they cannot then distribute designs to print an identical or similar statue. When a feature has both artistic (copyrightable) and functional (patentable) merits, when the question has appeared in US court, the courts have often held the feature is not copyrightable unless it can be separated from the functional aspects of the item. Additive manufacturing, starting with today’s infancy period, requires manufacturing firms to be flexible, ever-improving users of all available technologies in order to remain competitive. Advocates of additive manufacturing also predict that this arc of technological development will counter globalisation, as end users will do much of their own manufacturing rather than engage in trade to buy products from other people and corporations. The real integration of the newer additive technologies into commercial production, however, is more a matter of complementing traditional subtractive methods rather than displacing them entirely. As early as 2010, work began on applications of 3D printing in zero or low gravity environments. The primary concept involves creating basic items such as hand tools or other more complicated devices “on demand” versus using valuable resources such as fuel or cargo space to carry the items into space. Additionally, NASA is conducting tests to assess the potential of 3D printing to make space exploration cheaper and more efficient. Rocket parts built using this technology have passed NASA firing tests. In July 2013, two rocket engine injectors performed as well as traditionally constructed parts during hot-fire tests which exposed them to temperatures approaching 6,000 degrees Fahrenheit (3,316 degrees Celsius) and extreme pressures. In 2012, the U.S.-based group Defense Distributed disclosed plans to “[design] a working plastic gun that could be downloaded and reproduced by anybody with a 3D printer.”Defense Distributed has also designed a 3D printable AR-15 type rifle lower receiver (capable of lasting more than 650 rounds) and a 30 round M16 magazine. Soon after Defense Distributed succeeded in designing the first working blueprint to produce a plastic gun with a 3D printer in May 2013, the United States Department of State demanded that they remove the instructions from their website. After Defense Distributed released their plans, questions were raised regarding the effects that 3D printing and widespread consumer-level CNC machining may have on gun control effectiveness. Internationally, where gun controls are generally tighter than in the United States, some commentators have said the impact may be more strongly felt, as alternative firearms are not as easily obtainable. European officials have noted that producing a 3D printed gun would be illegal under their gun control laws, and that criminals have access to other sources of weapons, but noted that as the technology improved the risks of an effect would increase. Downloads of the plans from the UK, Germany, Spain, and Brazil were heavy. Attempting to restrict the distribution over the Internet of gun plans has been likened to the futility of preventing the widespread distribution of DeCSS which enabled DVDripping. After the US government had Defense Distributed take down the plans, they were still widely available via The Pirate Bay and other file sharing sites. Some US legislators have proposed regulations on 3D printers, to prevent them being used for printing guns. 3D printing advocates have suggested that such regulations would be futile, could cripple the 3D printing industry, and could infringe on free speech rights. Electric Car Invented, will Tesla succeed after all this time ?